This was a tight, rugged, and physical game most of the way. But after Ali Lucero swished two three pointers to end the third quarter, LHS was on their way to a WAC opening victory. 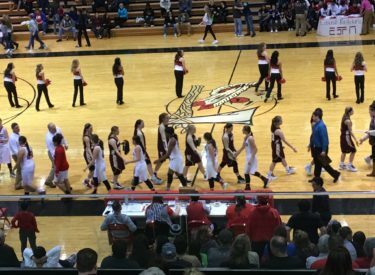 The Lady Redskins beat Hays for a fourth straight year in the Big House winning 59-44. LHS made seven of 18 three pointers on their way to the win. The Lady Skins built leads of 7-0 and 10-2 as Hays was playing for the first time on the road and for the first time since mid December. LHS led 10-8 after one. The Lady Indians and Lady Skins saw the lead see-saw back and forth in the second quarter and the score was 27-27 at the half. Hays led 30-27 before LHS raced to the 42-37 lead after three. LHS out scored Hays 17-7 in the fourth quarter. The Lady Redskins were balanced. Reyna Gonzalez scored a career high 11 and Lucero dropped in 11. Jada Mickens scored 10. Tenth ranked 5A Liberal is 6-1 and 1-0 in the WAC while #10 4A Hays is 4-2 and 0-1. Liberal hosts Garden City on Tuesday at 6 with Redskin Pre-game at 5:45 on 1270 and kscbnews.net.